WASHINGTON, D.C. -- Regardless of whom Ukrainians elect as their next president on May 25, this leader will need to be able to quickly gain the trust and confidence of a population that has had little faith in their past leadership. Since the Orange Revolution in 2004-2005, the majority of Ukrainians have said they do not have confidence in their government. 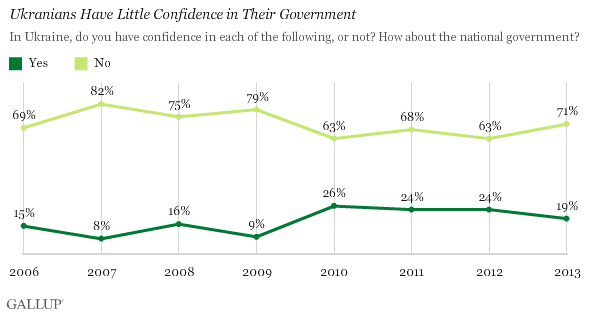 No more than 26% have had confidence in the past eight years. Ukrainian politicians have generally fared no better in terms of job approval. Viktor Yushchenko, who came to power in the wake of the Orange Revolution, left office in 2009 with an approval rating of 7%. While his ratings were low across the country, Yushchenko's unpopularity was even more stark in the East, where 1% approved of his job as president, compared with 8% in the Central part of the country (including Kiev) and 17% in the West. Ukrainians had higher expectations when President Viktor Yanukovych came to power in 2010. Yanukovych took office with 46% approval, but he quickly fell out of favor. However, Yanukovych elicited support from a much broader swath of the country than Yushchenko, garnering his highest job approval ratings of 33% in the East, but still earning 29% in the West and 20% in the Central region in 2013. Ukrainians did not reserve their low level of approval for their presidents. In 2009, 20% approved of Prime Minister Yulia Tymoshenko, who has recently been touted as a possible contender for the presidency, while 69% disapproved. Tymoshenko's highest approval came from the capital and Central region of the country (29%), while Ukrainians' views were less enthusiastic in the West (21%) and East (13%). Regardless of the political party in power, the past decade has seen Ukrainians continually unhappy with their leaders and government. Following the Maidan revolution in February, the country's long-frustrated citizenry will yet again have a chance to choose new leaders. However, the newly elected president will need to work to heal the rifts that the current crisis has exposed and address the country's deep economic problems to avoid the decline in approval that has plagued former leaders soon after they take office. Results are based on face-to-face interviews with approximately 1,000 adults, aged 15 and older, conducted in 2006-2013 in Ukraine. The most recent results are based on face-to-face interviews with 1,000 adults, conducted in June 27-July 31, 2013, in Ukraine. Results based on the total sample of national adults, the margin of sampling error is ±3.7 percentage points at the 95% confidence level. The margin of error reflects the influence of data weighting. In addition to sampling error, question wording and practical difficulties in conducting surveys can introduce error or bias into the findings of public opinion polls.